When Dr. Brian Westover DMD and Dr. Robert Kowal DDS crown one of our patients, the coronation is a celebration of a stronger smile. 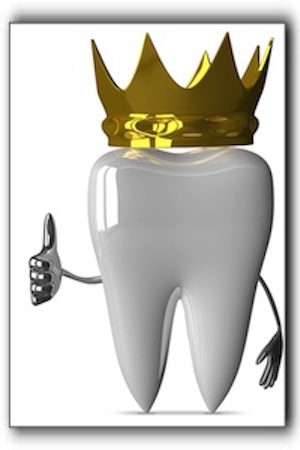 The necessity of a dental crown is usually readily apparent. Based on how much tooth is available to hold in a filling, sometimes a crown is required to add more support and to keep the tooth from falling apart or breaking. Crowns are also required as a sturdy support for dental bridges. Brookside Dental, located at 9225 SE Sunnyside Rd Ste 1 in Clackamas, OR 97015 97015, opened their doors in 2011 and has been serving patients throughout Oregon with extraordinary efficiency, expertise and personal attention since 2011. If you live in Clackamas, Gladstone, Gresham, or Oregon City, you could be our next royal to smile and wave for the paparazzi. Consult with Dr. Robert Kowal DDS to find out if you are a candidate for state-of-the art restorative procedures meant to increase the life of your precious permanent teeth such as a fabulous crown. Keep in mind that crowns come in a variety of strong, reliable materials. Matching the natural color of your teeth increases the beauty of your smile. Gold crowns are incredibly strong and have the “bling” factor. But there are certainly other options. We are equipped to offer restorative dentistry, dental implants, porcelain crowns, Invisalign invisible braces and a long list of other procedures. Schedule your visit today with our friendly staff at 503-905-3380.